Slovenia’s level of specialisation in agriculture is still low when compared to other EU Member States. This is evident from the number of specialised agricultural holdings and the area of agricultural land cultivated by these holdings. 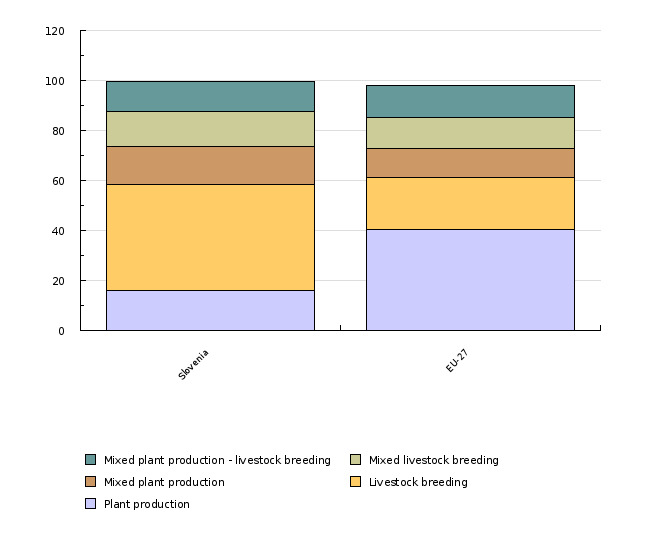 Relatively intensive specialisation in horticulture and moderate specialisation in arable farming are characteristic of plant production, while in livestock breeding, specialisation is present mostly as breeding of herbivorous livestock. In Slovenia, specialised agricultural holdings occupy more than two thirds (68%) of all agricultural land and generate 73.5% of the total value of the standard gross margin of agricultural production in Slovenia. • the share and trend of the area of utilised agricultural land by type of agricultural holding. To illustrate the production and economic effects of a specialisation, we have additionally presented the share and trends in the value of the standard gross margin on agricultural holdings by farming type. Statistical Office of the Republic of Slovenia, 2002, 2008. Statistical Office of the Republic of Slovenia, 2008; Eurostat, 2008. Slovenia ranks among European countries with the lowest degree of specialisation in agriculture. In the EU-27, more than 63% of all agricultural holdings are oriented toward one type of plant production or livestock breeding. In Slovenia, on the other hand, there are just slightly over 56% of specialised agricultural holdings according to the sampling survey carried out in 2007. In accordance with the available production structure, there are major differences in plant production and livestock breeding. Agricultural holdings oriented toward permanent crops prevail in specialised plant production and just under one tenth of all agricultural holdings fall into this category. Among specialised stock-breeding agricultural holdings, herbivorous livestock breeding is the prevailing type, with 41.9% of all holdings. 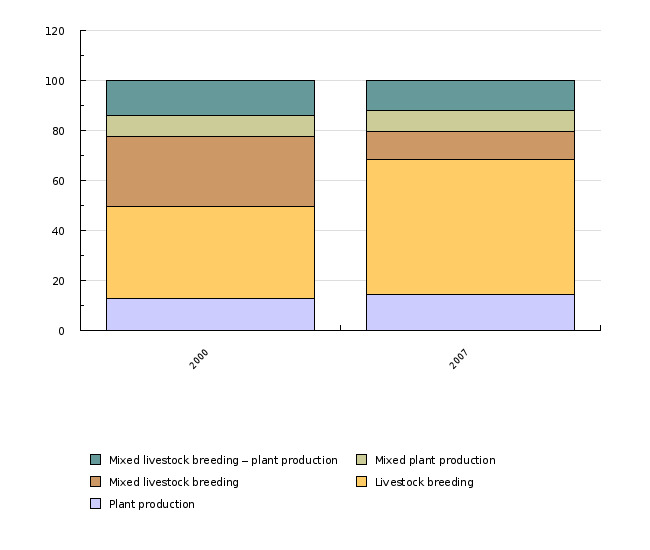 Slightly over 40% of all holdings fall into one of the mixed production types: mixed plant production, mixed livestock breeding, or a combination of both. 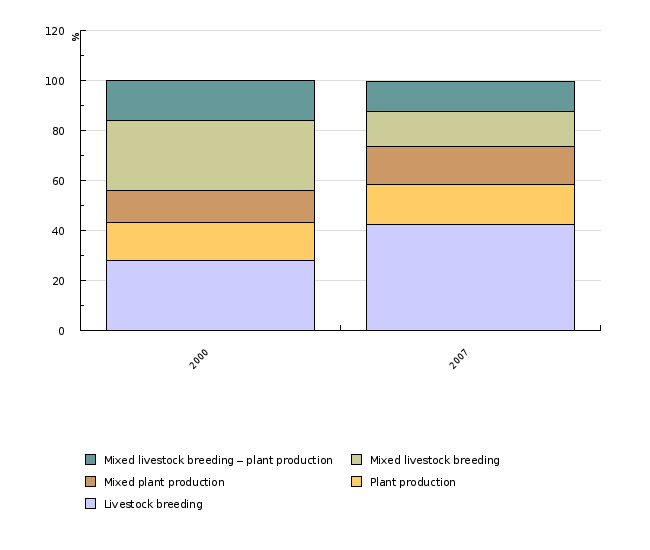 In the period 2000–2003, Slovenia saw its largest increase in specialised crop cultivation, horticulture and mixed plant production, while the number of specialised livestock breeding holdings, oriented mostly toward the production of granivorous pigs and poultry, and holdings with mixed livestock breeding, decreased. Specialised holdings in Slovenia occupy more than three thirds of all agricultural land. As much as 54% of agricultural land is cultivated by agricultural holdings specialised in livestock breeding, 53.5% of which are oriented toward herbivorous livestock breeding, while 11% of land is used by holdings with mixed livestock breeding. Specialised crop cultivation takes place in only 14.3% of the total utilised agricultural area, of which 8.5% is used for arable farming. In the selected period, a proportional increase in agricultural land was most notable in specialised horticultural and mixed plant production, and much less so in specialised arable farming production. In livestock breeding, only the agricultural land intended for herbivorous livestock breeding increased in absolute and relative terms. In Slovenia, specialised agricultural holdings make up almost two thirds of the total value of the standard gross margin in agriculture, of which more than one third is made up by agricultural holdings oriented toward herbivorous livestock breeding. The standard gross margin distribution by production type of farms resembles the distribution of agricultural land these holdings cultivate. - Statistical Office of the Republic of Slovenia, 2000. Dernulc, S., Iljaš, U., Kutin, B., Orešnik, I., Cunder, T., Golež, M., Juvančič. Survey of Agricultural holdings, Slovenia 2000. Results of research projects, 15, Agriculture and Food, Ljubljana, Statistical Office of the Republic of Slovenia, 256 pages. - Statistical Office of the Republic of Slovenia, 2004. 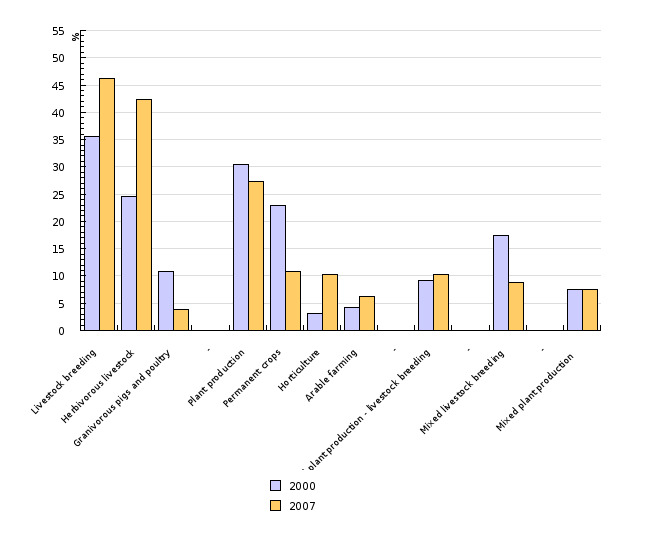 Structure of Agricultural holdings, 1 June 2003, Rapid Reports No. 13, Ljubljana, April 2004. The basic sources of information, used to calculate the values of indicators are structural surveys of agriculture carried out by the Statistical Office of the Republic of Slovenia. As in other EU countries, they are carried out every three years. Comparable data for 1997, 2000 and 2003 are available. In 2000, a complete survey of agricultural holdings was carried out which covered more than 86,000 agricultural holdings, and in 1997 and 2003, only sampling surveys were carried out.